Product prices and availability are accurate as of 2019-04-14 01:22:45 EDT and are subject to change. Any price and availability information displayed on http://www.amazon.com/ at the time of purchase will apply to the purchase of this product. INSTEN is a registered trademark. Only authorized seller of INSTEN can sell under INSTEN listings. All rights reserved. All trade names are registered trademarks of respective manufacturers listed. HEAT WAVE IS COMING: How to stay cool in hot weather especially during outdoor activities? This Compact and lightweight Cooling Fan is the survival tool you must have in this year. Save you from the heart stroke. Stay cool in hot and crowded places. SMART DESIGN: With 3 modes of speed and 2 modes of spraying. 20 ml water tank to contain enough moisture, while won't add extra burden to the fan. With 20 ml water bottle to fill water to the water tank with ease. LED display shows the operation mode. RECHARGEABLE BATTERY:: Power supplied by USB cable or lithium battery. Working time: 2 - 6 hours. Charging time: 3 hours. Keep you stay cool all day long with power bank. Perfect personal water misting fan for indoor - the office, home, dorm, study, library, games room or outdoor activities - beach, picnic, sporting events, camping, hiking, cycling. PERFECT FOR EVERYONE: Packed in a delicate box, a great gift idea for mothers, kids, friends, colleagues. 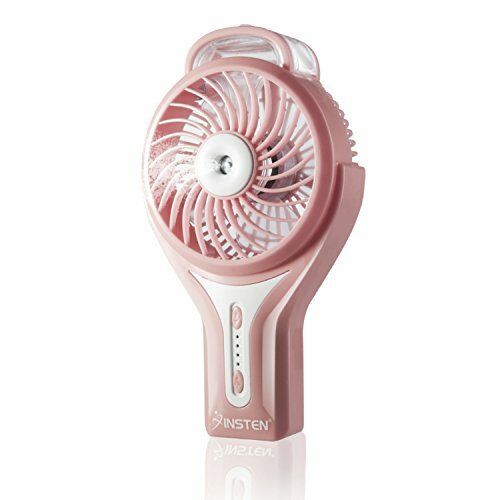 2-in-1 fan and humidifier which can refresh and moisture your face and skin. Weight: 190g. Size: 3.9 X 1.7 X 7 inches. Powered by: 1 X 16850 lithium battery or charging cable. PACKAGE INCLUDES: 1 X Mini handheld fan. 1 X USB charging cable. 1 X 20 ml water bottle. 1 X 16850 lithium battery.